The Monogram Dream Kitchen Design Contest was created to celebrate the imagination and creative vision inherent in beautiful kitchen design. All designs were required to integrate Monogram appliances and were judged across several award categories. We announced the winners last year and will be profiling each of them on Save Room for Design over the next few months. The third place winner in Best Transitional Kitchen Design is Tony Crosby from Tony Crosby Kitchens in Blairsville, Georgia. Tony: I think I have always had a design bug in me. Even as a young boy, I was always rearranging my room. I think it is something that is born into you. Tony: I especially love designing spaces for young couples newly married, or with just young children. One in particular, they are recently married and purchased their first house. We did a total renovation on the kitchen and bar space. She gave me a lot of freedom and I pulled ideas from her and designed a kitchen they will grow into with their family. Tony: The past five or seven years the trend has been an eclectic look. Which basically is mixing whatever makes you comfortable and happy. I believe it is here to stay. SRFD: Tell us about your winning project. Tony: Going into the project, I was working with an engineer who was one part of the marriage. Her husband was a perfectionist as well. I had just returned from the National Kitchen and Bath Show, so I was very excited about incorporating some of the new kitchen and bath accessories. It also was a complete renovation of the kitchen, down to the studs. An engineered beam had to be installed to hold the second floor, because we removed a load-bearing wall to open up the kitchen to a 180 degree view of the lake. We incorporated a dining table out of eight quarter cherry and married it to the Cambria countertops. We also used all Monogram appliances throughout the whole kitchen. With the help of Kelly and Charlie, we pulled off a wonderful kitchen for entertaining family and friends for years to come. Kitchen design is changing. From cool contemporary design accented by stainless steel, today’s kitchens are now the warm and inviting hubs of the modern home. Inspired by the possibilities, we introduced a new Graphite finish for Monogram Professional appliances – a sophisticated new look for refined kitchens that are extensions of the living and entertaining space. Much more than a simple finish option, Graphite is the meeting point of GE’s eye for design and its commitment to the cutting edge. The first finish designed for Monogram, Graphite finish lends warmth and richness to the kitchen, properly accenting a variety of design and color palettes. It also balances the need for everyday durability with the desire for high-end luxury through the Physical Vapor Deposition (PVD) manufacturing process, in which robust titanium material is vaporized into atomic particles and then layered atop stainless steel, creating an uncommonly strong, scratch-resistant surface. PVD is used across industries—from aerospace to automotive design to medical devices—but Graphite marks a first for its use to finish kitchen appliances. Introducing a new Graphite finish for Monogram Professional appliances, a sophisticated new look for refined kitchens that are extensions of the living and entertaining space. Graphite was developed in part through collaboration with FirstBuild, a Louisville-based community and microfactory that takes advantage of advanced manufacturing techniques and rapid prototyping to bring innovative ideas to life at lightning speed. Combined with GE’s lean manufacturing framework, Graphite was brought from idea to reality in unprecedented time. Restaurant-style pizza has long been an aspiration for home chefs everywhere, but a reliable way to achieve the perfect slice has been lacking. Residential pizza oven options have run the gamut from cumbersome and complicated to convenient yet disappointing, spurring the development of the new Monogram pizza oven. Perfectly crisp crust. Browned, bubbling mozzarella. The Monogram pizza oven brings restaurant-quality cooking capabilities to the home kitchen, enabling home chefs, entertainers, families and pizza enthusiasts to recreate their favorite pies—from the perfect Neapolitan to New York-style and everything in between—quickly and with ease. Combining elegant Monogram styling and the sophisticated technology of FirstBuild, the Monogram pizza oven brings authentic old world taste to today’s high-end kitchens. The Monogram pizza oven brings restaurant-quality cooking capabilities to the home kitchen, enabling home chefs, entertainers, families and pizza enthusiasts to recreate their favorite recipes quickly and with ease. Simple installation. The Monogram pizza oven fits into the small space of a standard wall oven cavity, yet is spacious enough to fit a pizza peel and large pies for the whole family. Best of all, the Monogram pizza oven incorporates a compact interior ventilation system, requiring no special installation or construction—a one-of-a-kind feature. On time, guaranteed. Don’t worry not about delivery times from the local restaurant; the Monogram pizza oven can cook pizzas in just two minutes after a speedy 30-minute preheat. Precision and power. Using regular electric power, the Monogram pizza oven delivers precise zone-controlled heating, enabling exact temperatures for your perfect pie. App-enabled. Integrate the Monogram pizza oven into your digital ecosystem with available app-linking for pizza at the touch of a button from your smartphone. The Monogram pizza oven was developed through FirstBuild, a new model of manufacturing that challenges makers around the world to ideate and help design innovations in home appliances. As the high-end consumer appliance market continues its upward trajectory, the Monogram pizza oven marks a significant early innovation and a sign of cutting edge products yet to come. Learn more about the Monogram pizza oven, availability and pricing on the press release. The third place winner in Best Traditional Kitchen Design is Karen Smith from Integri Kitchens in Alberta, Canada. Karen: Well I do remember as a kid constantly changing my room around. I got my start in the kitchen business when I decided to renovate my own kitchen. I had a friend who worked in the kitchen business for many years whom I was working with on our renovation. During the course of the project she turned to me and said, “You should come and work for us, you’d be really good at this.” It was about a year later that I decided it was time for a change, went and spoke to the company she worked for, and the rest is history. That was in 1991 and as I look back, I can’t believe where the time has gone. Karen: I have to say that I enjoy every project. They all look amazing when they are finished and it’s so rewarding to have clients say how much they are loving their space. Whatever space you’re involved in, whether it be a kitchen, bathroom, closet, office, clients have different criteria they want met and sometimes they don’t know what they want, so you’re guiding them through the process. It’s definitely a team effort to see a project to fruition, from the clients, to contractors, designers, suppliers, and our own support team, job coordinators and installers. I think the goal of everybody involved in a project is to create a beautiful, functional space for the client that they’re happy with and proud of. I’ve met and worked with many great people over the years. What’s the expression … “It takes a village to raise a child” … it definitely takes a team to build a kitchen! Karen: I don’t know that I’m necessarily over it but I’m concerned about the amount of grey out there. We’ve gone from dark charcoals and browns to greys. I do love many of the grey hues, but there’s just seems to be so much of it and I’m wondering if it is going to be a very short-lived trend. Karen: I’m loving the touches of bling and glitz that are so prevalent these day. It’s so glamourous and sparkly ….. Combined with the amount of white cabinetry we’re doing, spaces are opening up and becoming light and bright and airy. We live in the north and the days are so short and nights so long that the brightness tends to lift the spirit. Karen: This was obviously a great project to work on. The homeowners were looking for a comfortable, wide-open space to entertain in and to just hang out in and have a glass of wine. They like a traditional look off-set by the professional look of the appliances. The homeowners didn’t want to add square footage to the home, and by eliminating a large pantry, we were able to gain the space we needed to fulfill their wish list. We’ve got a wall of tall cabinets which incorporates a 8” deep pantry, taking advantage of a space in front of a chimney, a bar space with textured glass pocket doors, as well as tons of convenient storage, stacked ovens and warming drawer. The built-in fridge ensures a clear walk-way, and rangetop and tons of drawers ensure an efficient cook centre with great ventilation. The rangetop is framed by narrow pull-outs for spices, oils and vinegars. A touch of interest was added with the stacked glass doors flanking the rangetop area and an appliance garage with a lift-up door for storage was incorporated at the end. The main sink sits in front of the new, larger window that was installed. The huge island takes advantage of the space by following the flow of the room. 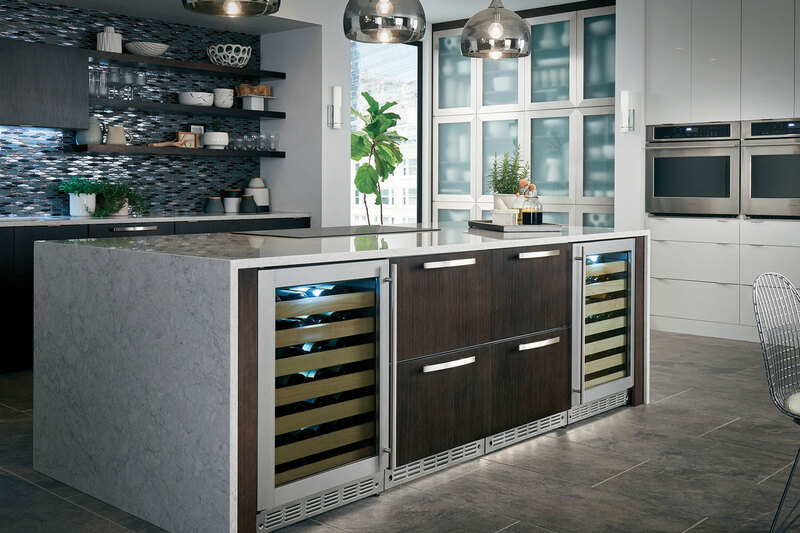 It has a bar/prep sink, a beverage fridge and a wine fridge, garbage and recycle bins and still more drawers … The showstopper is the round stacked granite counter at the end with a clean edge, supported by a round base covered with a ragged copper pattern. The thicker edge on the counter adds some definition to the island without having to change the height of the stools. This keeps the seating at a comfortable height and gives the sense of a more intimate space. This project was a combined effort by many talented people, starting with the homeowners, to achieve the amazing end result. Today’s profile highlights Brenna Krouse with K Squared Construction in Sacramento, California. Brenna Krouse with Josh Temple, host of House Crashers, in the home she designed for the TV show. Brenna: I remember as a kid, always rearranging the furniture in my room. As I got older, I loved looking at model homes. Then when I was 19, I started working in a design center for a higher end home builder and fell in love with design. Brenna: Wallpaper! It’s a super fun way to add color and texture! Brenna: I learned a lot about the higher end gas ranges! I never really paid too much attention to the differences between the brands.